Hello my lovelies, and happy Friday! Our short stint of glorious spring, almost summer-like weather has passed so I'm back to my more winter-to-spring looks even though it's already early April. 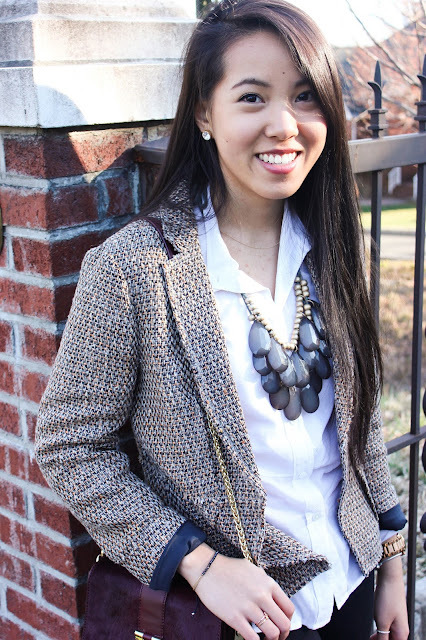 Though this tweed blazer looks quite heavy, it's actually the perfect weight for a day when it's around 60 degrees and you don't feel like carrying another coat. I kept the base of the outfit very simple with my black pixie pants and a collarless white blouse from Theory. 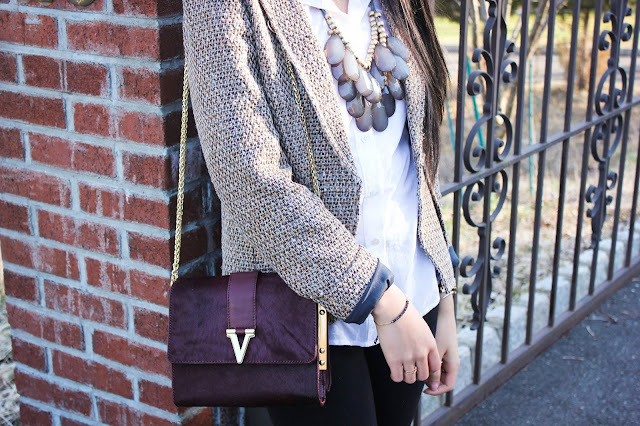 I chose a large draped necklace to make the outfit more feminine and tied in the rich tones with my new oxblood shoulder bag from Vince Camuto. I am absolutely in love with this bag because the combination of pony hair with leather and gold hardware is simply beautiful, and hey, every girl wants a pony right? See, dreams do come true! Once again, PETA advocates please don't kill me. Last, I have to talk about the shoes which my feet call heaven. Seriously the most comfortable pair of flats I own! Though most people lean towards the Reva's, I went with the Caroline's because I like to make my feet happy :) Hope you all enjoyed this week of posts, and I'll see you Monday! Have a stylish and beautiful weekend my darlings! Very cute Erica! I wouldn't have known you were so close to me if you didn't tell me you were from Jersey! 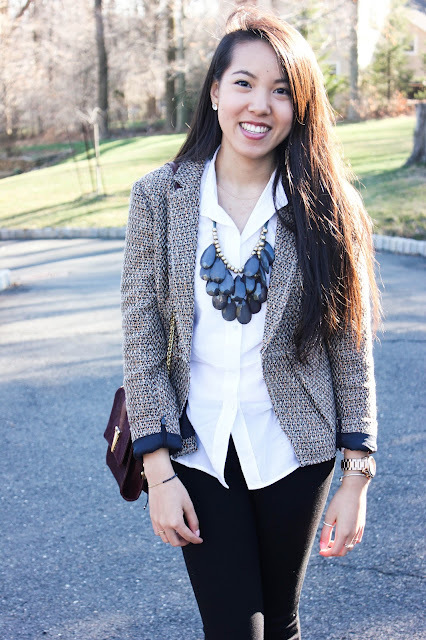 I love the touch of oxblood you added to your outfit ensemble, it really pairs well with the Tweed. I've been looking for a Tweed jacket for so long that doesn't seem too matronly, but it's been quite a search to find one in my size. I love yours, too bad it's already sold out! I have Revas, but I have to admit, they aren't quite as comfy as the Carolines. The Carolines are much more flexible.